Do you know what do you with your paper? How much paper do you have? File cabinets, boxes, bins, folders, bags, etc? Do you know what to do with all of your paper? There are three kinds of paper that we have. Actionable paper refers to paper that has an action attached to it. This could be making an appointment, responding to an invitation, paying bills, planning a vacation, reimbursements, ordering information, prescription refills, coupons, etc. Reference paper refers to paper that you need to keep, but you don't need to access on a daily basis. Some examples of this are mortgage, insurance, taxes, birth & death certificates, warranties, receipts for large purchases, financial documents. Sentimental papers can include photos, brochures from vacations, memorabilia, event programs, letters, kids art projects, and more. We can get so overwhelmed with paper that we don't know what to do with it. It piles up on the kitchen counter, desk, baskets, drawers, etc. The thought of going through all of the paper can be overwhelming. We can become paralyzed just thinking about what to do. If this is how you feel, you are't alone. A lot of people want to get their paper organized and don't know how to start. I want to encourage you that you can do it! You can take a step on getting your paper organized. And, the first step is: Start! How do I start, where do I start, what in the world is the first thing? Begin with gathering all of your papers, and begin with a sort. You have one decision to make: keep or toss. Once all of your papers are sorted, get rid of the toss (recycle or shred) and then you have only what you want and need and then can begin to organize what is left. This first part can take a lot of time, but once you have eliminated all of the paper that you don't need, you may be left with a much more manageable pile. Now, it's time to organize the rest! Do you feel like you are drowning in piles of paper? Do you get frustrated trying to keep track of everything? I completely understand how so much paper can be exhausting! So many people are trying to get your attention! Start by unsubscribing from all unsolicited mail, email, and phone calls. Go HERE to find all the ways to do this. This is one way to start stopping the unwanted stuff. Just take one small step to begin! How organized are you Holiday decorations? Do you use them all, or are you keeping decorations that have outlived their purpose, belong to children that have moved out, or you just don’t even like anymore? Are you overwhelmed and frazzled with the thoughts of getting “organized for the holidays”? Here are a few ideas to use this season if you are overwhelmed with decorating for the holidays. As you unpack, choose, and display your decorations, delete the ones that you aren’t going to use again. Don’t even put them back into the box! Bless someone else who is just starting out and would love some holiday cheer! Do you still have ornaments that belong to your adult children? Collect them, wrap them up, and gift them their ornaments as they begin to decorate their own homes. Take photos of your decorations so you will remember how you used them. This is helpful if you are tempted to purchase new decorations. You don’t need to rely on memory when shopping. If anything has broken, or the lights have stopped working, throw them away! Clearly mark your storage containers when you put your holiday decorations away. Simplify, simplify! If you don’t have the time you used to have to decorate, don’t feel like you need to go “all-out”. Decorate with fewer decorations. Use the ones you enjoy the most and have great holiday memories and sentiment. Enjoy the holiday season. Don’t get overwhelmed with trying to “Do It All”. This season is meant to celebrate Christmas, not create unnecessary stress. If you need helping getting organized, Organizing Your Chaos is happy to help you get ready. We are also available to help you with the Christmas clean up. We can be an extra set of hands when un-decorating. We can also help you to maximize your holiday storage. ​Here in the midwest the weather is finally getting nice. I don't know about you, but I don't really like to work outside when it's cold. My garage is a mess, and this Saturday is the day! Yes, I'm super excited about getting into my garage and getting it organized! You may live somewhere that doesn’t have a garage; maybe you have a carport, or no garage at all. You can still use these tips to organize your outdoor storage area. It's best to do this project if you have nice weather, because you will to be able to pull the things out of your garage onto the driveway. You may not want to start this project unless you have at least two hours to work on it! Turn your vehicle around and have the back end facing the garage. This is so that you can load it up with the things that you are going to donate or return. Loading up your vehicle as you clean out the garage gets you one step closer to getting rid of things. And, they won’t be coming back into the garage! Bins, boxes, buckets to use for sorting items. And a broom to sweep out your newly organized garage. Does this belong to someone else? Yes…give it back and get it out of your garage! Do I want this item? Yes…keep No…give away, donate, sell. Does it work? Yes…keep. No…trash. After you have sorted through all the things that you have taken out of your garage, keep them grouped together. 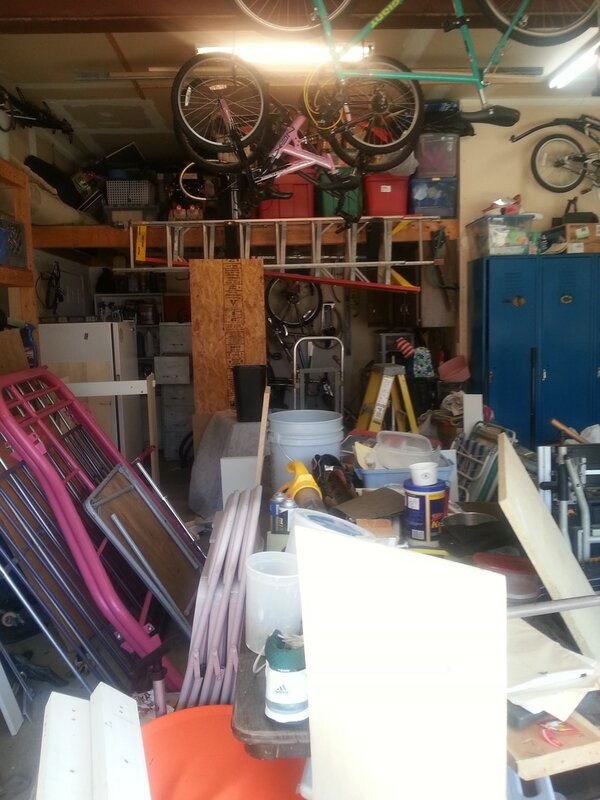 Now that the garage floor is empty you have space to begin sorting the rest of the things that are in your garage. You might have items that are hanging on the walls, on shelves, or even hanging from the ceiling. If you have a folding table, you can use this to sort items. Sort items that go together into bins, boxes, or buckets. After everything is sorted, look around and decide where the best places to put things back are. Do you have the proper storage solutions. Are you using vertical space? Do you need shelving, hooks, and bins? Determine if you have what you need. You may need to take a trip to your local WalMart or Home Depot. Before you go, measure your space so that you purchase the right size. It's a bummer if you get your new storage solution home to find out that it's not the right size! Items that are not used very often, or are seasonal can be stored up high. The items that you use most often should be stored in the easiest to reach places. Children’s toys can be stored down low. . Begin to put your garage back together! If you are storing items in totes, be sure to label them. It's so much easier to read a label on a bin that do drag it down off of a shelf because you can't remember what is inside of it. Especially if you have several that look the same. Now that you have organized the garage, load up your car and drive the donations away! I'd love to hear what big things you were able to get rid of! Email me and let me know how your garage organizing is going!